Kimberley Okamura began her training at Westside Ballet at the age of 10. She also studied with Robert Joffrey in San Antonio, Texas, at School of American Ballet, and at the San Francisco Ballet School. 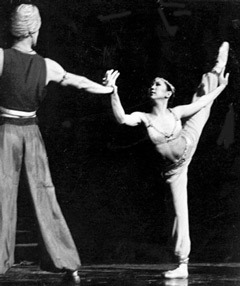 Kimberley’s roles at Westside Ballet included Arabian in The Nutcracker. She joined San Francisco Ballet in 1987 and danced there for 11 years. Her repertoire is diverse, including Jerome Robbins’ Interplay, Paul Taylor’s Company B, and many Balanchine works. Choreographers she has worked with include William Forsythe, Mark Morris, Lar Lubovitch, James Kudelka, David Bintley, Val Caniparoli and San Francisco Ballet artistic director Helgi Tomasson. Kimberley returned to dance as a guest artist at Westside Ballet’s 2002 Gala. She then devoted her time to academia as a Regents Scholar studying American Literature and Culture at UCLA.